Though a part of the Louisiana Purchase Exposition Company committee wanted the Fair to be on the magnificent Mississippi River in Carondelet, they conceded to the idea of more hilly Forest Park, in the southern end of St. Louis. The park was at a central point between the north and south of town, away from unsightly factories and slums, but easily accessible by public transportation. There, they could landscape sweeping views of the surroundings as well as views of the river. In addition, the park already had streets in place as well as good water pressure. Furthermore, stately private streets such as Westmoreland Place and Portland Place were located near the park. Because parts of Forest Park would have to be cut down, the Exposition Company was hit with a lawsuit by environmentalists. The 'Wilderness,' as the northwestern corner of the park was called because of its untouched dense woodlands, was a difficult issue to win, so the committee compromised, they would only utilize 657 acres of the park. So as not to reduce the scale of their vision, they obtained land to the west, including leasing (for 650,000 dollars), the new but not yet occupied property that would make up Washington University campus. Several private families leased the Fair land south of Washington University. On Dec. 20, 1901, Francis held a groundbreaking ceremony on a frozen site just southwest of the Missouri History Museum. They burned wood to thaw the ground, to pound in the oak spike, signifying the beginning of construction. The statue of St. Louis would be placed there. A commission of architects was created to tackle the design stage of the fairgrounds. Formed on June 27, 1901, they consisted of independent architects, landscape architects, the heads of six architectural firms and three advisors; this group was given the enormous task of the entire design and layout of the Fair. Julius Pitzman, a respected St. Louis city planner, noted the problem of the Des Peres river. Not only did the polluted waterway frequently flood, but its winding route left no space for large palaces to be constructed. Designer of Works- Isaac Taylor suggested Pitzman and advisor George E. Kessler that the river should be shortened by half, straightened and placed underground. The Rich Construction Company transformed the river into a three chambered sluiceway (to vary the flow of the water) during the frozen winter in 65 days. Work began on the `Chain of Rocks' water purification basins to clean up St. Louis' drinking water and provide clear, flowing water for the cascades and fountains of the Fair. Contracts to complete four of the palaces were awarded prior to `repairing' the river. The lowest contractor bid included having to subscribe to Louisiana Purchase Exposition stock. At a price tag of 604,000 dollars, the first palace to be contracted (and constructed), was the Palace of Varied Industries. Huge pilings were driven into the unstable ground to support the build's wooden foundations and supports as well as the ornate casted staff (strengthened plaster). Wood, (which was cheaper than steel), allowed workers to attach the mainly ivory-covered staff, much easier. Over one million feet of scaffolding was used in its construction. Workers earned between 1.50 and 5 dollars a day. redesigning a river were done by horse drawn, earth-moving equipment, simple sweat, muscle and determination. the transformation of Forest Park into an ornate wonder. On occasion, a few steamed-powered pieces of equipment were utilized. 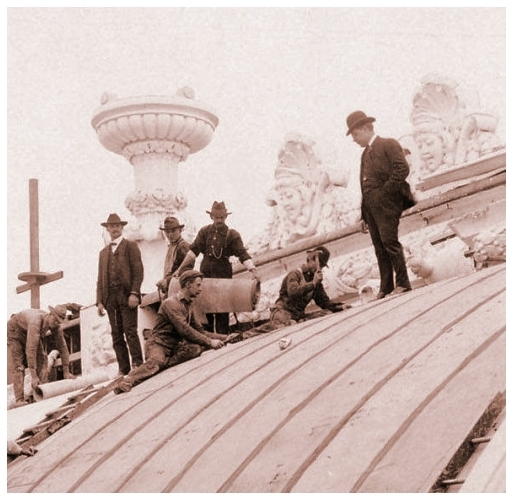 Northwest view from the Palace of Education of workers finishing a roof, during the summer of 1902. Building the electrical conduit which was a mile long. Deverting the Des Peres River. Driving the ceremonial first spike . Building Committee opening building bids. A view eastward frpm the Administration Building in August, 1902. Palace of Electricity, scaffolded during construction. Carpenters drilling holes and placing bolts in timbers during construction, June 1902. Staff Eagle statues waiting to be placed on te Palace of Education. 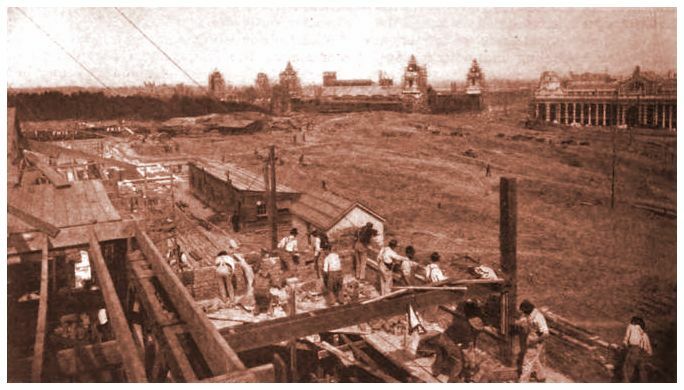 West end of Palace of Electricity, constructing a canal. September. 1903. 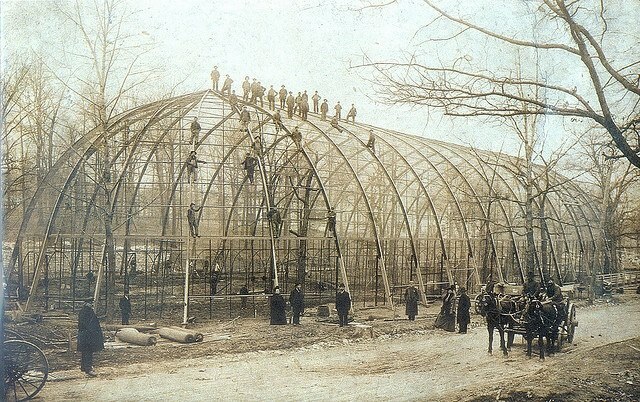 Dome and section of the Palace of Varied Industries during construction. But as time sped by with slow progress, it became evident that the 1903 opening was unrealistic. Preparations for a Fair of this nature were more time-consuming than first thought and without additional commitments from foreign and national exhibitors to entice visitors and businesses, the project would become an economic disaster. More time was needed to finish the physical structure of the Fair and the hotels to accommodate fairgoers and visitors to St. Louis. 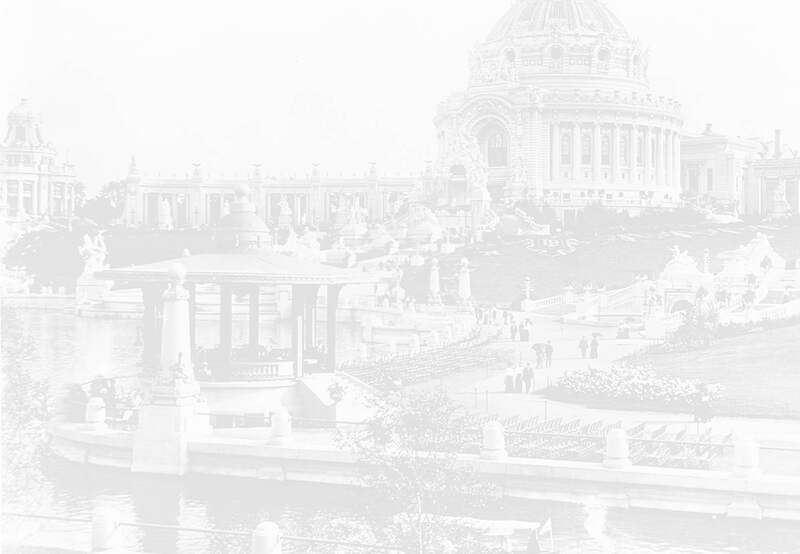 With Francis, Taylor and the city of St. Louis asking for more time, Congress delayed the Fair's opening until 1904. 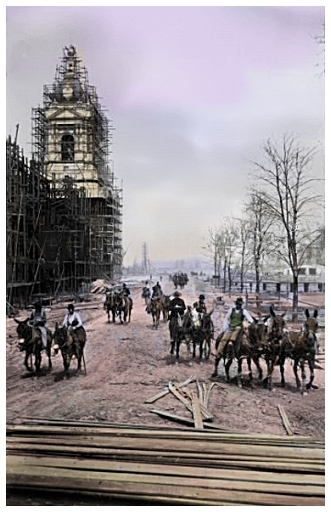 A colorized image of construction workers, with Palace of Machinery to background left. A scaffolded Palace of Machinery during construction. View of grounds from the Fine Art Building. Building the floor of the Manufacturer's Building. The Palace of Electricity is in the background.